The Firenze Card, Florence's discount sightseeing / transport pass. 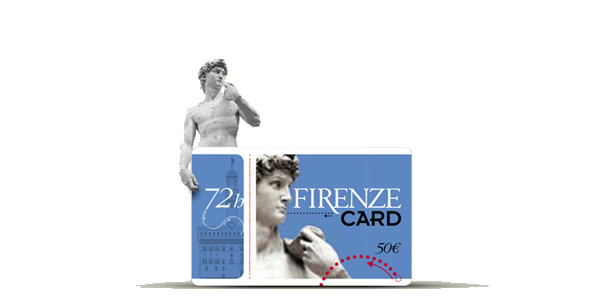 Florence may be the last city in Europe to introduce one, but it finally has a a single card—called the Firenze Card (www.firenzecard.it)—that costs €72, is valid 72 hours, and it good for free entry to many major museums, villas, and historical gardens. Amazingly, this includes all the biggies: the Uffizi (normally €8, booking fee would add €4), the Accademia (where they keep Michelangelo's David; €8 + €4 booking fee), the Pitti Palace (€8.50 for the main collections + €7 for the gardens and smaller museums), the Bargello (€4), the Palazzo Vecchio (€6.50), and the Medici Chapels (€6). In fact, separate admissions to just those museums listed above would total €56 (including the highly recommended skip-the-line booking fees for the Uffizi and Accademia—the others don't need advance booking). 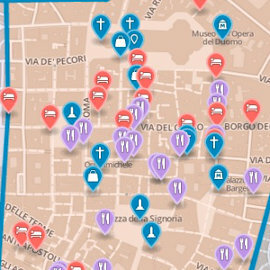 Add in a few other major sights over the three-day validity period—like San Marco (€4), the Brancacci Chapel (€6), and Santa Maria Novella (€5)—and the card will have almost paid for itself. The Firenze Card has other benefits. You don't need to make reservations to visit any site, and you can skip the long ticketing lines—just flash it at the entrance of any participating sight (see the box on the right for a list). The ticket for Santa Croce also gets you into the nearby (and far less compelling) Casa Buonarotti, home to Michelangelo's very earliest sculptures (basically stuff he did as a student—which is interesting in of itself). This article was written by Reid Bramblett and was last updated in February 2015.